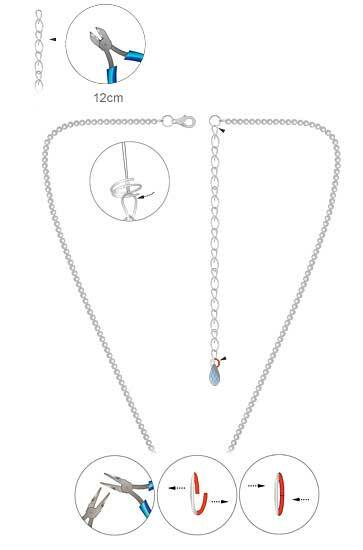 Open one 12mm jumpring, insert one Swarovski pendant article 6190 35mm crystal moonlight and close jumpring. 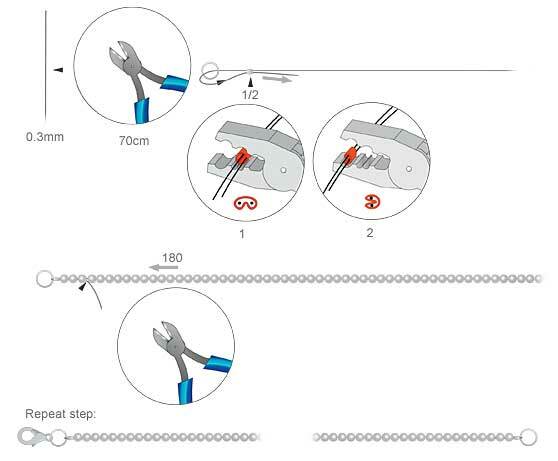 Attach a 5mm jumpring and a 7mm jumpring to the 12mm jumpring as shown in the illustrations. Insert a Swarovski pendant article 6010 11x5.5mm chrysolite opal onto a 5mm jumpring. Repeat this step 15 times. 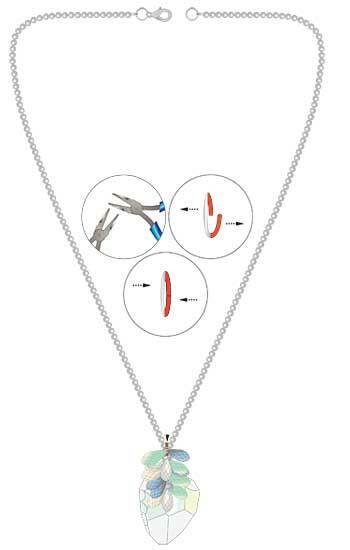 Open a split ring and insert a lobster clasp onto it. Cut 70cm tigertail and insert it through a 6mm split ring and back through a crimp bead. Pull the tigertail tight and crimp the crimp bead with crimping pliers. Insert 180 Swarovski Crystal pearls article 5810 3mm crystal light grey opal onto the tigertail. 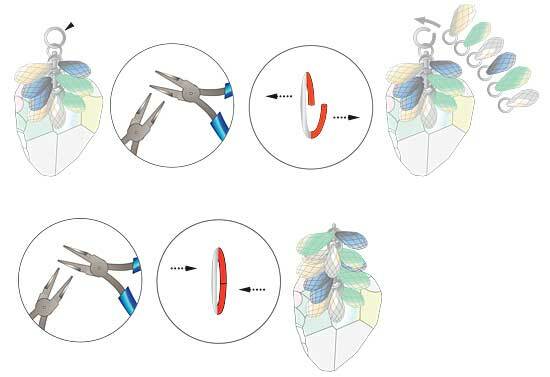 Repeat crimping process for the other end of crystal pearl strand using the split ring with the lobster clasp prepared in Step 5. 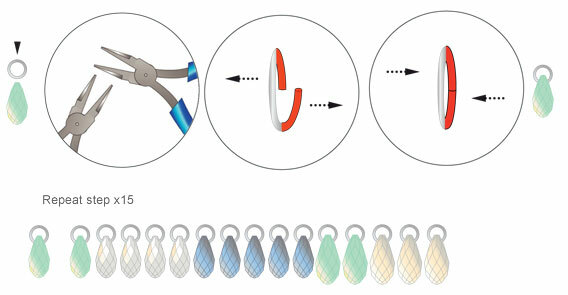 Slide the tigertail ends through the first three crystal pearls on both ends and cut off the excess tigertail as shown in the illustrations. 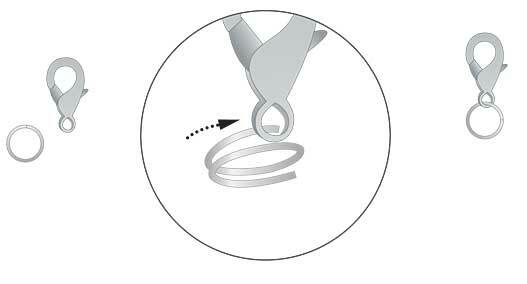 Open a 7mm jumpring and attach it to the center of the crystal pearl strand. 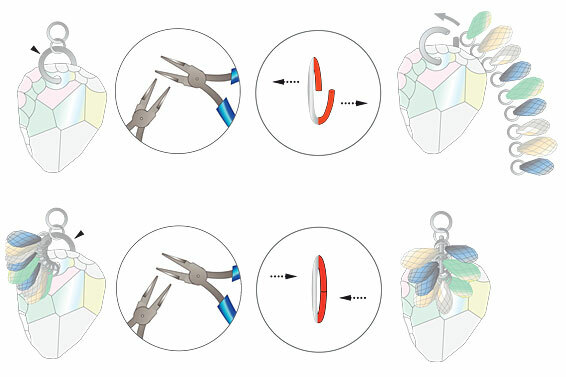 Add the Swarovski rock pendant created in Step 4. Close the jumpring to secure. Cut a 12cm chain and attach it to the split ring on the crystal pearl strand. 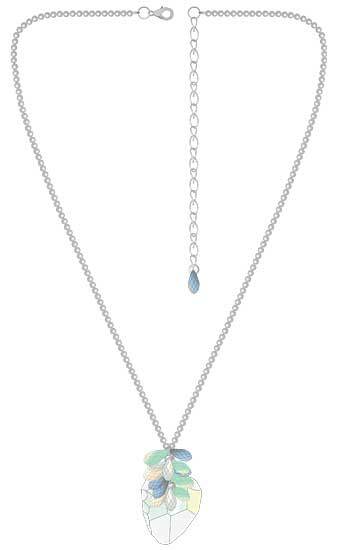 Open a 5mm jumpring and attach the other end of the extension chain to one Swarovski pendant article 6010 11x5.5mm crystal light grey opal. Make sure all jumprings are closed to secure.